The Registrar’s Office at Witten/Herdecke University is always available for answering your questions. You will receive the information and documents required for registration as soon as you have accepted the place to study in the application management section (via the electronic campus management system UWE). The registration period for the summer semester is from the second week in March up to and including the second week in April, and for the winter semester from the first week in September up to and including the second week in October. The 'Instructions for application' leaflet provides information on the individual steps to be taken. Registration as a student or doctoral student in UWE also gives access to the UWE manual. A click on 'short guide to UWE' opens a window. Here you are requested to register with your access data. The manual contains many useful instructions how to handle the system, such as how to set up a study plan, learn about examination dates, and register for exams or cancel registrations. Very important: We will send any important information exclusively to your UW/H email account. Therefore, please check your UW/H email account (https://owa.uni-wh.de/) on a regular basis. Please be advised that redirected emails may not reach you and you miss important information as a consequence; so we recommend not setting up email forwarding. All students and doctoral students have to re-register every semester. Please see the next section for more information. Information for registered students and doctoral students is available on the Intranet. Students having an accident or getting injured at UW/H or on their way to the university need to contact the Registrar’s Office as soon as possible as the Registrar’s Office has to send an accident report to the 'Unfallkasse NRW'. Please see our above mentioned contact details. Which deadline must be met for submitting the documents? The 'Important Information' leaflet contains the relevant information. What do I have to do when I receive messages concerning the health certificate, such as “the health certificate has not yet arrived”? I have questions concerning the social welfare contribution and/or semester ticket. The social welfare contribution for the 'Hochschulwerk' amounts to 52.50 euros per semester. The 2017 summer semester ticket price is 189.38 euros. Are there any first-year student events? I have questions concerning the internship. I have questions concerning the selection of courses. How do I get the information I need to register? Please read the 'Important Information' leaflet and the other flyers carefully – they contain any information you need. Did all my documents arrive? The Registrar’s Office examines your documents as quickly as possible. You may check your document checklist any time via UWE (https://uwe.uni-wh.de/campusonline/webnav.ini) to see whether your documents are complete. How do I proceed from application to registration? I have not yet received an email for selecting a registration date. What shall I do? 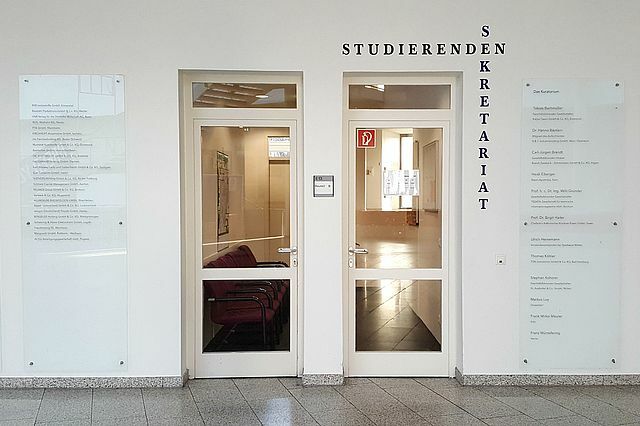 As soon as all documents have been set to OK in UWE (exceptions: your identity card and the form for the StudierendenGesellschaft – you will bring them along when registering), you will receive email instructions on how to select a date for registration in the calendar. Until when do I have to remove the lock flags? All necessary steps to remove the lock flags must be taken within the re-registration period. I am a long-term student/student exceeding the standard period of study: How quickly do I have to make an appointment? Please make an appointment with your dean within the re-registration period. Do I find the online form for re-registration/deferment in UWE? What is a 'study schedule'? The 'study schedule' form (overview of further course planning) has to be completed by students exceeding the standard period of study, long-term students and long-term doctoral students. They will receive a separate email 14 days before re-registration. I plan to graduate in the current semester. Do I still have to re-register? Even if you plan to graduate in the current semester, we recommend you re-register for the coming semester since there might be delays for a variety of reasons so that your graduation would be postponed to the coming semester. I have been denied permission to access the system. Lock flags: What can I do? What is it about? All lock flags must be removed by taking the necessary steps within the re-registration period. If you do not know how to proceed when a lock flag indicates an outstanding obligation, please immediately contact the Registrar’s Office for advice (either by phone or by email). I am a doctoral student. Do I have to re-register? All registered doctoral students have to re-register for the next semester. I was ill and therefore unable to re-register. What shall I do? Please re-register and contact the Registrar’s Office. Why do I have to complete an online form for re-registration? At other (public) universities it is sufficient to pay the social welfare contribution and semester ticket. We will inform you about all steps to be taken for re-registration by email. All steps are also explained in UWE (menu - studies - lock flags). I am long-term doctoral student. What do I have to do to re-register? You will receive a separate email including the relevant information 14 days before re-registration. Long-term doctoral students have to take the necessary steps to remove the additional lock flag within the re-registration period (study schedule and appointment). I was/am abroad. How shall I re-register? Despite the fact of being abroad during the re-registration period, you have to re-register prior to the re-registration deadline. I would like to apply for deferment for the next semester. What do I have to do?